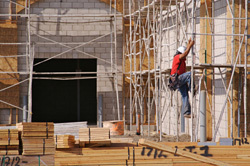 In general, scaffolding boards are used during construction or maintenance, and since they are going to support the workers, including their materials, it is imperative that these items be both sturdy, as well as level. When individuals are searching for the best possible options, in terms of these boards, they should start out by picking the appropriate materials from which these boards are going to be made, as this will affect the strength and the price of these items. The two most popular materials that are used to manufacture these products are wood and steel, and they each come with their own pros and cons. Before determining which option is best for you, it might be a good idea to find out everything there is to know about both types of products. The most common scaffolding boards are manufactured with wood, and so it is easy for individuals to get their hands on these specific items. It is important that professionals take note of the type of wood that was used to manufacture the product that they are intending to purchase, since specific types of wood are stronger than others. Redwood, for instance, is very strong, and items constructed from this material are usually the most popular. Maintaining your scaffolding boards is extremely important, since even the smallest cracks or chips might make the item vulnerable. During inspections, the wood needs to be checked for wear, rot, mold and cracks, and remember, it is important to inspect these items before purchasing them, especially if they are being bought second hand. Individuals who want to strengthen the products that they purchase might want to invest in a treatment that will add to the durability of the wood, as well as prevent it from becoming damaged through exposure to the elements. Another popular material that is used to make scaffolding is steel, and this is because this material does not rot or become moldy in the way that their wooden counterparts do. One of the biggest disadvantages of these items, however, is the fact that they cost a lot more than wooden boards, but since they will last much longer, individuals might want to spend some time considering whether this might be the better option, especially if an individual is going to make use of it over a longer period of time. Those that are looking to save money when purchasing their scaffolding boards might want to consider opting for second hand products, instead of purchasing them new. There are now a wide variety of construction companies, as well as retailers, that stock these items second hand, and this means that individuals will be able to purchase their equipment at a fraction of the usual cost. It is advised, however, that individuals take the time to inspect the item before they make a purchase, as not all of these products are of the highest quality. While saving might be a big concern, your safety should always come first, and this means taking the time to ensure that you are able to recognize a quality product when you come across it.